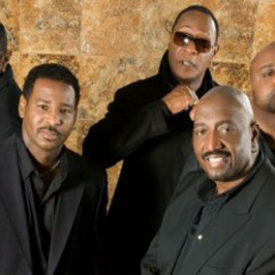 The history of the Temptations is the history of contemporary American pop. An essential component of the original Motown machine, that amazing engine invented by Berry Gordy, the Temps began their musical life in Detroit in the early sixties. It wasn’t until 1964, however, that the Smokey Robinsin written-and-produced “The Way You Do the Things You Do” turned the guys into stars. An avalanche of hits followed, many of which – “My Girl,” for instance-attained immortality. “It’s Growing,” “Since I Lost My Baby,” “Get Ready,” “Too Proud to Beg,” “Beauty Is Only Skin Deep,” “I Wish It Would Rain”-the hits kept coming. When the sixties and seventies turned political, the Temps got serious. They changed their tone, dress and music. Producer Norman Whitfield led the way. His Temptations hits, many featuring Dennis Edwards who had replaced David Ruffin, burned with intensity. “Runaway Child,” “Cloud Nine,” “I Can’t Get Next to You,” “Papa Was a Rolling Stone” and “Psychedelic Shack” still smolder. Other stellar singers-Richard Street, Ali-Ollie Woodson-joined, adding their luster to the group’s growing fame. It began with their appearance on Motown 25 in 1983; it continued with the NBC mini series that chronicled the group’s history, a ratings triumph over two nights in prime time. Phoenix Rising went through the roof, a platinum-plus mega-hit featuring “Stay” the Narada Michael Walden-produced song that topped the charts. Terry Weeks, who grew up in Alabama and spent eight years in the Air Force before his makeshift audition for Otis on a Hollywood street corner, who’s smooth textures and tones, express an extraordinary full range of feelings. Newest member, Bruce Williamson started singing in a church choir at the ripe age of 5 years old and hasn’t stop since. He has sung in everything from commercials to musical to the top showrooms in Las Vegas. Bruce was introduced to Otis by Ron Tyson.